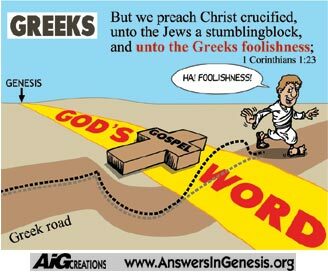 ‘But we preach Christ crucified, unto the Jews a stumblingblock, and unto the Greeks foolishness’ (1 Corinthians 1:23). When Peter preached to the Jews in Acts 2:22-41, his message centred on the Cross. The Jews were a creation-based culture, believing in the true God, understanding sin (having the Commandments), but by and large not accepting the message that Jesus Christ was the Messiah–this was their stumbling block. 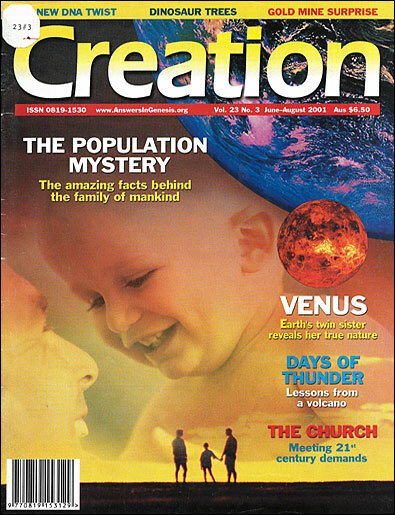 One could say though that the Jews were on the right road–they believed the writings of Moses and the Prophets (which included the accounts of Creation and the Fall in Genesis, hence the reason for sin and the need for God’s forgiveness–as well as prophecies of the coming Messiah who would take away sin). But they didn’t accept the truth that Christ was the fulfilment of these prophecies. Peter’s preaching (from a human perspective–knowing that it is God who opens hearts) involved removing the ‘roadblock’ (rejection of the Cross) that stopped them from being truly saved. Thousands were saved from Peter’s preaching that day. The following diagram represents this situation. The Jews were on the right road, starting with the right beginning–they had the right foundational knowledge to understand the Gospel–but they had a problem, a ‘roadblock’ that needed resolution. In Acts 17:18-34, Paul preaches the message of the Cross to the Greek philosophers. However, this culture, in contrast to the Jews, was ‘evolution-based’ (their philosophers taught an early concept of evolution; they had no idea of the God of Creation, as the Jews understood). They had no understanding of the meaning of sin or why death was in the world. They did not have the foundational knowledge to understand the Gospel. They thus responded by claiming that Paul’s message was foolish. Paul was nonetheless able to reach some of these Greeks with the truth of the Gospel, and thus an understanding of the message of the Cross, by taking them back to the true beginning of history, starting with Creation, Adam and Eve, and the Fall of man. E.g: ‘God that made the world and all things therein, seeing that he is Lord of heaven and earth, dwells not in temples made with hands’ (Acts 17:24). ‘And has made of one blood all nations of men to dwell on all the face of the earth, and has determined the times before appointed, and the bounds of their habitation’ (Acts 17:26). As we begin the 21st century, we need to understand that generations of young people are being taken through an education system that is by and large devoid of the knowledge of God. They are being taught that the universe can and should be explained only by natural causes–nothing supernatural was involved. These people are being directed on to a road similar to the one the Greeks were on. This road detours them away from an understanding of the Cross, because it does not have the right beginning/history leading to the message of the Cross. Most of today’s students are really ‘Greeks’ in their thinking, and thus respond to the message of the Cross as ‘foolishness’. Thus, when evangelists preach the message of the Cross to today’s generation, they are dismayed that increasingly people scoff at the message. The listeners, by and large, can’t understand the Gospel because they are on the ‘Greek Detour’. To be successful in reaching today’s generations with the Gospel, like Paul in reaching the Greeks, these people need to be shown the way back to the true beginning of history (Creation, Adam and Eve, Fall, etc. ), to get them onto the right road, so they will understand the message of the Cross. At the same time, the evolutionary humanistic propaganda these people have been taught needs to be counteracted. In some ways, these ‘modern Greeks’ are even harder to direct onto the right road, as they have been thoroughly brainwashed against Christianity through our culture’s concerted attack on its Genesis foundations. It’s a long hard road to get them back to the right road. Sadly though, there is an even greater problem. Many, if not most, of the emerging generations in our churches are being taken off the right road their church upbringing had them on (the Bible’s account of the origin and history of the universe). Again because of government schools, media, television and so on, they are being diverted onto the Greek road. And there is an even greater problem than the one above–the majority of Christian leaders have compromised with ‘Greek’ (evolutionary/billions of years) thinking. These leaders, by compromising the Word of God beginning in Genesis, have effectively taught their congregations that one can accept much of the world’s teachings on origins and reinterpret God’s Word in Genesis accordingly. Thus, many in the church are being taken by their own leaders on a ‘ramp’ off the right road, ending up on the ‘Greek’ one. No wonder many Christian parents and grandparents are looking on in dismay at their children and grandchildren, wondering why these younger generations don’t have the same respect for God’s Word as they do. They don’t understand that even in the church, many in the younger generations are on the ‘Greek’ road. 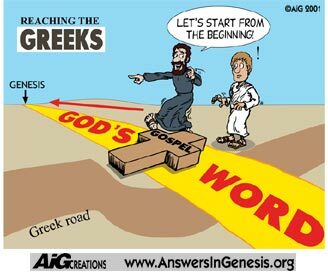 Again, just as with Paul’s ministry to the Greeks, if we are to reach ‘Greek’-thinking people today, we need to get them to exit the ‘Greek Road’ and make a new start with the right history (Biblical history) to put them on the ‘Creation Road’, so they will accept the Bible’s credibility and understand and receive the message of the Gospel as they ought. Sadly, the ‘Greek road’ is leading millions of people to the City of Destruction like that warned of in the book Pilgrim’s Progress–and like the pilgrim, Christian, we need to see people on the road to the Celestial City. That is what the Answers in Genesis ministry is all about. You can help by widely disseminating the information in our materials to Christians and non-Christians alike.